On the day, Hasan Rowhani was inaugurated, a documentary was shown on the Islamic Republic state TV about the new president. The "Elected President" was the name of the documentary which glorified Hasan Rowhani as a long serving trusted figure of the establishment, who has been through the thick and thin and served in various key positions as a loyal reliable servant of the regime. 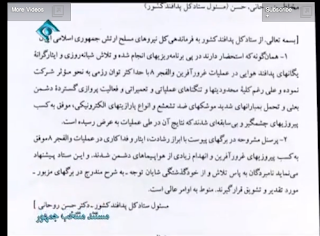 In the documentary a letter was shown- see screenshot on the left. It commends the air defence personnel for their courage and successes in recent operations. Nothing wrong with that of course. The letter is signed by the then head of Iran's Air Defences, Dr. Hassan Rowhani. The date of the above letter is April 20, 1986, almost a decade before Rowhani got his PHD from Glasgow Caledonian University. So the question once agains remains unanswered, where did Rowhani get his other PHD from?! This time there can be no accusations of misunderstanding by the reporter who interviewed him or photoshop forgeries of documents to slander him, it is an official letter shown on his own documentary which was aired from Iran's state TV.